HANOI, Vietnam - Mainstreaming good practices, finding the ‘right price’ of rice, and working together as a region are crucial to making rice production sustainable. These are key points resulting from the discussion of global experts and stakeholders convened as the rice working group during the recently concluded 2nd Responsible Business Forum for Food and Agriculture held in the Vietnamese capital. Proactive regional cooperation in agriculture, especially for rice—the region’s most important crop staple—becomes even more crucial with the establishment of the ASEAN Economic Community. The unique culinary features of heirloom rice varieties from the Cordilleras were featured at the BellySima Food Festival as part of the market outreach of the Heirloom Rice Project (HRP) that is jointly implemented by the Department of Agriculture and the International Rice Research Institute. BellySima Food Festival 2015, held at the Glorietta 3, Makati, City on 12-13 June 2015, features and promotes healthy Filipino food options and experiences among consumers and entrepreneurs. Heirloom rice was included in the Top 10 People's Choice among 40 participants to the festival. Event organizer RJ Ledesma of the Mercato Group expressed appreciation of the participation of HRP. "It is worth celebrating that more people know of these fantastic rice varieties in the country," Ledesma said. At the festival, heirloom rice Ominio from the Mountain Provinces and the Tinawon rice from Ifugao, along with other heirloom varieties from Benguet and Kalinga were cooked and sampled by food enthusiasts. All these rice varieties were grown by highland farmers with the Rice Terraces Farmers Cooperative (RTFC), one of the implementing partners of HRP. HRP is working toward increasing productivity of heirloom rice, which takes 6–7 months to mature and are thus grown only once a year. By linking heirloom rice to potential export and domestic markets, farmers are able to sustain their livelihoods, the cultural prize of which is that the rice terraces that the region is famous for are preserved. The HRP is a shared collaboration between the DA-Philrice, DA-Cordillera Administrative Region field office, local state colleges and universities, and IRRI. The Bellysima Food Festival is a regular event at Glorietta 5 beginning 19 June 2015. The Plant Breeding Center, in collaboration with the Confucius Institute, hosted the Plant Breeding for Food Security symposium on the global impact of plant genetics to rice production in honor of the work of Gurdev Khush. Dr. Khush is an agronomist and geneticist who shared the 1996 World Food Prize with Henry Beachell for his achievements in attaining global rice security during a time of exponential population growth. After serving as a faculty member of the University of California for seven years, he joined the International Rice Research Institute (IRRI) in the Philippines as a plant breeder and was appointed head of the Plant Breeding Department in 1972. He spent over 21 years at IRRI directing and participating in genetic research and breeding. Dr. Khush played a key role in the development of more than 300 modern high-yielding rice varieties, which helped increase world rice production from 257 million tons in 1966 to 626 million tons in 2006. He returned to UC Davis where he is currently adjunct professor. With a panel of his international colleagues and mentees, Dr. Khush addressed the symposium to discuss the challenges he faced during the Green Revolution, and once again expressed his dedication to and deep appreciation for the faculty he learned from, claiming, “UC Davis faculty prepared me for those challenges.” Audience members engaged the highly respected line-up of international and local speakers with questions and suggestions for future research, and to share stories of how Dr. Khush inspired them in their own work. Over 200 guests came from all over the world to attend the day-long symposium to discuss the advances of global production in rice, wheat, and tomato; the future obstacles that face an ever-growing world population; and the technologies that will revolutionize farming and food production. Rice production significantly contributes to Cambodia’s national food security and poverty alleviation, according to Agricultural Development and Climate Change: The Case of Cambodia. However, several factors are keeping Cambodia’s rice yield the lowest in the region. Majority of lowland farmers grow only a single crop annually since they are dependent on rainfall. The increasingly erratic rainfall in recent years due to climate change has also adversely affected the country’s crop production. In addition, most farmers still rely on traditional agricultural practices and seeds. The various concerns on seed and modern technologies were discussed during the inception workshop of the Accelerating the Adoption of Stress-tolerant Rice Varieties by Smallholder Farmers in Nepal and Cambodia (USAID-ASTV) project. USAID-ASTV, a USAID-funded project, seeks to reduce poverty and hunger as well as increase food security and income of poor farm households. Dr. Abdelbagi Ismail, a scientist at the International Rice Research Institute (IRRI) and project leader, presented the systematic implementation of USAID-ASTV as 1) varietal evaluation and release; 2) seed production and distribution; 3) GIS and targeting; 4) monitoring and evaluation; 5) baseline, market studies and impacts; and 6) policy support to adoption of stress-tolerant rice varieties. Conducting a study on market demand of varieties to be promoted by the project. Developing seed quality control and producers of foundation and certified seeds capable of supplying demand within the project and beyond. Creating a strategy for promoting new rice seeds and the adoption of new technologies by farmers. A workplan for each group was drafted and the final version will serve as the guiding document for the strategic implementation of the project. The inception and planning workshop for USAID-ASTV was held on 8-9 June in Phnom Penh. H.E. So Khan Rithykun, director general of Cambodia’s General Directorate of Agriculture, and Dr. Bruce Tolentino, IRRI deputy director general for communication and partnerships graced the closing of the event. J.K. Ladha, a principal soil scientist and agronomist at the International Rice Research Institute (IRRI), is the recipient of the 2015 International Service in Crop Science Award for his outstanding contributions to agronomy. The award is given by the Crop Science Society of America. Dr. Ladha is a recognized authority in science and technology for food security and sustainable management of the world’s major cereal cropping systems. He is also the IRRI representative to India and Nepal, and provides leadership in developing and executing the vision and agenda of the Institutes’s research on crop and resource management in South Asia. The impact of his research is evident from the number-one rank for number of publications in refereed journals and in h-index for citations in the whole CGIAR system. Dr. Ladha authored or co-authored 209 research articles in peer-reviewed international journals, and 95 in proceedings or books. Currently, Dr. Ladha is the regional editor of the journal Biology and Fertility of Soils. The award will be formally presented to Dr. Ladha on 17 November during the scientific society’s International Annual Meeting in Minneapolis, Minnesota, USA. In commemoration of the 117th Philippine Independence Day on 12 June , IRRI’s sectoral organizations AIRESS, AISAS, IFSA and SINOP led a special flag raising ceremony on 11 June. For the 117th year, the celebration theme is Kalayaan 2015: Tagumpay sa Pagbabagong Nasimulan, Abot Kamay na ng Bayan (Triumphs Through Reforms, Within Nation’s Reach), . Dr. Violy Villegas gave the invocation, Ms. Bernadette Joven led the singing of Philippine National Anthem while Mr. Joseph Sandro led the pledge of allegiance to the Filipino flag. The keynote speakers for the event were Mr. Eufracio “Jun” Domingo, representing the Municipality of Bay, host community of IRRI, and Dr. Bruce Tolentino, deputy director general for Communication and Partnerships. Mr. Dehner De Leon, accompanied by Mr. Thor Roxas on guitar, gave a heartfelt rendition of the song Bayan Ko while Dr. Casiana Vera-Cruz provided the program’s closing remarks. Also in attendance were Atty. Gingin Perez and Mr. Jojo Lapitan. Ms. Aurora Hettel and Mr. Manuel Marcaida were awarded Best in National Costume while SINOP bagged the prize for the largest contingent. Mr. Manuel Marcaida and Ms. Meggy Lou Katimbang served as emcees. The program was followed by a Filipino breakfast at Kari’s Garden. The Philippines hosted the Food Safety Risk Communication Workshop as a member state of the ASEAN Expert Group on Food Safety (AEGFS), which is under the auspices of the Senior Official Meeting for Health Development (SOMHD), ASEAN Health Ministers Meeting (AHMM). Delegates from Cambodia, Lao PDR, Indonesia, Malaysia, Philippines, and Vietnam, with observers from the health, agriculture, and science & technology departments participated in the workshop. Food safety is a top priority in the Strategic Framework on Health and Development adopted by the Association of Southeast Asian Nations (ASEAN). Cooperation and communication are key factors in ensuring that appropriate messages are conveyed to stakeholders and the public, especially when there are safety issues surrounding food. On 3 -5 June, the Food and Drug Administration of the Philippine Department of Health (DOH) and the International Rice Research Institute (IRRI) organized a training workshop on food safety risk communication for the ASEAN Plus Three. The workshop is in line with the DOH’s commitment to the food safety improvement plan of the ASEAN to strengthen the capacity of national authorities to manage food safety risk communication. The workshop covered the fundamentals of risk communication and collaborative techniques on communicating food safety risks presented by resource speakers from the DOH, Food and Health Organization, University of the Philippines Los Baños, and IRRI. Dr. Mariane Umali, manager for stakeholder outreach and advocacy of the Golden Rice project, facilitated the module on the use of multimedia channels and social media in risk communication as well as best practices. The workshop also provided a venue for sharing experiences in risk communication. The first two days of the workshop was held at the Asian Institute of Management in Makati City while third session was conducted at the IRRI headquarters in Laguna. Dr. Bruce Tolentino, IRRI deputy director general for communication and partnerships, welcomed the delegates and provided an overview of the Institute’s research agenda. Meanwhile, Dr. Violeta Villegas, Golden Rice project coordinator, briefed the participants on IRRI’s healthier rice program. Mary Ann Somera, a farmer from Abra, holds a printed version of the RCM recommendation for her rice field that helped her get higher yields last year. Also in photo is Mr. Edwin Joseph Franco, the focal person for Rice Crop Manager in CAR. Results from the use of Rice Crop Manager a decision-making tool for rice farmers, in the mountainous rice paddies of the Cordilleras in northern Philippines have been encouraging. A farmer-cooperator in Brgy. Tamalunog, Flora, Apayao, used Rice Crop Manager (RCM), accessible through mobile or internet connection, for growing a season’s crop. He as well as local agriculture authorities were pleased to note a huge increase in his harvest as a result. The farmer harvested 111 sacks of rice from a half-hectare field, while a fellow farmer harvested less than half of this from the same size of land. RCM is an app that provides rice farmers recommendations on management of nutrient, pest, weed, and water depending on the specific rice variety used, yield from the previous season, and specific conditions of a farm. It could potentially be a very important tool for farmers in remote areas to get accurate farming information. Farmers would usually have to go to the nearest extension office for this kind of assistance. “These good results have encouraged many other farmers to try RCM,” said Jayrex Pablo, a young agriculturist at Flora, who also reported that his office is close to reaching 300 farmers in the area. Rey Duldulao, a rice farmer from Luna, Apayao, had earlier used RCM, through which he learned that he did not have to apply so much fertilizer as he used to. “I was surprised, because my yield got even better—as if RCM knew the texture of my soil,” Duldulao said. His farmer's association maintains close contact with the local agriculture office to keep themselves up to date on good practices and new technologies available. Scholars of Nuffield Australia visited the International Rice Research headquarters to get a general overview of IRRI’s research activities. The seven scholars were welcomed by James Quilty. Dr. Quilty heads the Experiment Station where some of the world's most productive and important rice varieties are developed and first tested. Dr. Quilty presented an overview of the Institute and discussed current research activities. He also conducted a field tour of IRRI including the Long Term Continuous Cropping Experiment, the world's longest-running rice research project, and the International Rice Genebank, which holds more than 127,000 types of rice, including modern and traditional varieties, and wild relatives of rice. The Nuffield Australia scholars also met with Dr. Noel Magor, head of IRRI’s Training Center. Nuffield Australia awards scholarships to farmers in Australia to develop potential and promote excellence in all aspects of Australian agricultural production, distribution and management through the adoption of local and international best practices. The scholarship provides the opportunity to study farming practices in New Zealand, Europe, Asia, and the Americas and those countries best suited to the scholar. They also promote a closer understanding between farmers in the countries visited. Upon returning to Australia, scholars are expected to actively spread the knowledge and understanding they have gained among their fellow farmers and others. The Nuffield Australia scholars visited the IRRI headquarters on 8 June. Apple snails (Pomacea canaliculata and Pomacea maculata), which were introduced from South America as food source, have become one of the most damaging pests of rice throughout Southeast Asia. The introduced snails rapidly spread to Indonesia, Thailand, Cambodia, Hong Kong, southern China, Japan and the Philippines in the 1980s. Their presence has been recorded in Myanmar since the early 2000s, but until recently were restricted to the mountainous Shan and Kachin States. Between 2011 and 2012, the snails first appeared in the rice growing regions of Mon and Kayin States and in the Ayeyarwaddy Delta–Myanmar’s principal rice growing region. On 6 June 2015, a workshop designed to tackle the threat posed by apple snails was held at the Plant Protection Division (PPD) of the Ministry of Agriculture and Irrigation (MOAI) in Yangon. The workshop, with over 20 participants, was opened by Dr. Pyone Pyone Kyi, deputy director of PPD. The workshop also featured the symposium Managing apple snails in Myanmar rice: reducing damage, preventing spread, and protecting native biodiversity. During the symposium, Dr. Finbarr Horgan, entomologist at the International Rice Research Institute (IRRI), discussed apple snail ecology and presented a management strategy for controlling the pest. Mr. Aung Ko Win, a student at Yezin Agricultural University, presented his preliminary findings on the distribution of apple snails in southern Myanmar while Dr. Khin War War from Yangon University and an expert in microsnails presented her observations on apple snail distribution in Myanmar lakes. Updates on the status of apple snail infestation in Kayin State, Mon State, and Ayeyarwaddy Delta were provided by Mr. Khun Mg Mg (assistant director, PPD), Mr. Aung Zaw Maing (PPD), and Mr. Win Soe (MOAI), respectively. Infestation trends in the Ayeryarwaddy Delta were the most worrisome. Mr. Win Soe’s data indicated a 6 fold increase in damage at Dedaye Township between 2013 and 2014, with new focal infestations at several other locations in 2014. It appears that the snail is spreading rapidly and is set to change rice farming practices in Myanmar for the foreseeable future. A crucial part of the workshop was an apple snail management plan prepared by participants and experts. The management plan is designed to 1) fill knowledge gaps, 2) improve snail management in affected areas, 3) improve preparedness in vulnerable areas, 4) develop education programs for extension officers, quarantine personnel and rice farmers, 5) improve quarantine policy, and 6) conserve native snail species that are likely to be displaced by the invader. The management plan, together with didactic materials, will be available in a document to be prepared by IRRI and the PPD. Robert Zeigler, director general of the International Rice Research Institute (IRRI) and Arvind Kumar, IRRI senior scientist, were admitted to the Fellowship of the National Academy of Agricultural Sciences. Both scientists have been elected to the Fellowship in recognition of their significant contributions to the agricultural sciences in India. Dr. Kumar received the Fellowship citation and Certificate of the Academy at the ceremony held on 5 June in New Delhi while Dr. Zeigler was admitted in absentia. Prof. M.S. Swaminathan, founding president of the Academy and former IRRI director general (1982-1988), presented the awards. Vijaya Kumar Marthi, manager-Liaison and Coordination) at the IRRI office in India was also recognized at the Silver jubilee celebration of the Academy. Dr. Marthi was cited for his services rendered to the Academy in various capacities including the head of the Academy secretariat from 2002 to 2008. Among the guests at the event included Dr. S. Ayyappan, current president of the Academy and a member of the IRRI Board of Trustees, and Prof. R.B. Singh and Prof. V.Ll Chopra, both past presidents of the Academy. The National Academy of Agricultural Sciences provides scientists with a forum to deliberate on important issues of agricultural research, education and extension, and to present views of the scientific community to policy planners and decision makers at various levels. His Excellency Ty Sokhun, Secretary of State, Ministry of Agriculture, Forestry and Fisheries, stressed that sustained rice production growth was a major goal for Cambodia at the launching of a new project promoting stress-tolerant rice varieties. Accelerating the Adoption of Stress-tolerant Rice Varieties by Smallholder Farmers in Nepal and Cambodia (USAID-ASTV), a USAID-funded project seeks to contribute to the efforts of the USAID and the government of Cambodia toward poverty and hunger reduction and increase food and income security for resource-poor farm households, through provision and distribution of high-yielding rice varieties tolerant of abiotic stresses. Bruce Tolentino, deputy director general for communication and partnerships at the International Rice Research Institute (IRRI), added “Two aspects for the secret of rice growth in Cambodia are farmers’ easy access to modern rice varieties from IRRI since the start of their partnership; and Cambodia’s openness to trade and linkages with Thailand and Vietnam. Dr. Faith Bartz, USAID representative, emphasized the need for a strong partnership among the stakeholders of the project to ensure the success of its implementation. The USAID-ASTV inception and planning workshop, held on 8 and 9 June in Phnom Penh, was attended by over 60 participants from the General Directorate of Agriculture-Department of Rice Crops, Provincial Department of Agriculture, Cambodian Agricultural Research and Development Institute, seed producers and millers, international and non-governmental organizations, and the Royal University of Agriculture (RUA), and Nagoya University (satellite campus in RUA). Dr. Abdelbagi Ismail, IRRI principal scientist, is the overall project leader for USAID-ASTV. Dr. Dule Zhao, IRRI Representative to Cambodia, is the project coordinator in Cambodia while Dr. Uma Shankar Singh, IRRI senior scientist based in India, is Nepal’s project coordinator. A team of experts conducted mid-project review of Diversification and intensification of rice-based cropping systems in Lower Myanmar (MYRice) in Ayeyarwady Delta. MYRice conducts research on cropping options for the Delta, to increase and sustain productivity of both rice-rice and rice-pulse cropping systems. It will also support the introduction of options to reduce post-harvest losses. The review looked at the progress of its outputs, progress towards impacts, lessons learned as well as its planned activities in rice-rice and rice-pulse systems in the area. One of the highlights of the review was the discussion with farmers from the project sites. Farmers shared how the project has helped them and identified other needs they hope MYRice could address. Farmers of rice-pulse systems from Nga Gyee Gayat and Pan Pin Su in Maubin township shared their experiences with the rice varieties they selected from the Participatory Varietal Selection trials, provided insights on post-harvest losses, and noted activities on exploring market options and seed sources. Farmers of rice-rice systems from Tar Pat and Ah Lann, on the other hand, said they would like to participate in learning activities about market options and knowledge sharing with other farmers. Project staff from the Department of Agriculture, Department of Agriculture Research, and the International Rice Research Institute (IRRI) provided the reviewers with updates on the adoption of new, suitable varieties, alternative cropping systems, and post-production options. The reviewers also interacted with MYRice gender research team and members of the Postharvest Learning Alliance. Research and extension officials from the Department of Agriculture and Department of Agricultural Research provided insights on the lessons learned and possible future opportunities where the project could help. Dr. Grant Singleton, IRRI scientist and project leader, was pleased with the review that showcased suitable technologies for the Delta. He also noted how farmers are actively participating and keen to raise their needs and share their experiences, which triggered strong discussion between the end- users, project implementers, and reviewers. The reviewers were Dr. Gamini Keerthisinghe and U Aye Tun.Dr. Robert Edis, manager of the Soil Management and Crop Nutrition Research Program of the Australian Centre for International Agricultural Research, served as resource person. The mid-project review was held from 25-27 May in Yangon City and Maubin Township. The Young Researchers' Lunch for June hosted Catherine Propper, professor in the Division of Biological Sciences at Northern Arizona University, USA. Dr. Propper's research focuses on amphibians and endocrine disruptors. She is visiting IRRI to work on a collaborative project on biological diversity in rice fields. During the lunch, Dr. Propper shared the story of her career path that led her to working on amphibians and chemical pollutants. She told the group some interesting anecdotes about pressures coming from regulatory agencies and common stipulations of working with private companies. She also shared her ideas about strategies to increase amphibian populations in rice fields. Participants were Cindy Llorente, Tahir Awan, Iman Zarei, Quynh Vu, and Sith Jaisong. Members of the Postharvest Learning Alliance reviewed the impact of its activities on trying new varieties, exploring market options, testing postharvest technologies, and sharing rice-based management options with farmers in Maubin Township. The Learning Alliance (LA) aims to bring farmers, scientists, extension agents, and other stakeholders together to field-test, refine, and adapt integrated rice production systems, and learn and share good practices. The 38 farmers who participated in the activities shared their experience in growing the salt-tolerant Sin Thwe Latt (use less input) and the Sin Thu Kha (use more input) in the previous cropping seasons. They also discussed key information on seed production methods and crop production practices they gathered from interacting with the Shwebo farmers who produce high quality Paw San variety and reported a better understanding of how rice quality affects prices after visiting different markets in Yangon. U Nay Lin Oo, a farmer from Tar Pat village in Maubin Township, shared his experience using the IRRI-designed TC-800 lightweight thresher.“I was able to thresh faster and improved the quality of grains,” he said. In addition, members planned their future activities that include planting Pyi Taw Yin that they have selected from the participatory varietal trial for its good yield. They also discussed how the project could further help farmers and other end users to boost their rice production with the review team from the Australian Centre for International Agricultural Research (ACIAR) and Department of Agriculture officials. The Postharvest Learning Alliance is implemented through Diversification and Intensification of Rice-based Cropping Systems in Lower Myanmar (MYRice), an ACIAR-funded project in partnership with the Department of Agriculture, Department of Agricultural Research, and key private sector partners. The meeting was held in Maubin Township on 25 May. LOS BAÑOS, Laguna - The National Food Authority (NFA) signed earlier today (5 June 2015) a memorandum of understanding (MOU) with the International Rice Research Institute (IRRI) on improving rice quality in the Philippines. Under the MOU, the NFA and IRRI commit to promote and accelerate research on rice and rice-based farming systems toward establishing international-level standards for rice quality. Joint work will also be done toward consistent application of such standards for the benefit of all players in the Philippine rice industry, from farmers to consumers. "Through this agreement, the NFA hopes to maximize IRRI's research in achieving our food security mission of providing the country’s rice requirements in terms of volume and quality. This will also guide us in our decision-making, not only in our operational activities but also in our policy-formulation, in anticipation of future developments such as infrastructure build-up," said NFA Administrator Renan Dalisay. Rice quality encompasses rice farming technologies and practices that help ensure sustainable agriculture, improved farmer welfare, grain quality, and dietary practices that support improved nutrition and health among consumers. "We are happy to share technologies, some partly developed through work funded by the Department of Agriculture on grain quality and forecasting, with NFA," said IRRI Deputy Director General Bruce Tolentino. Tolentino assured Dalisay of IRRI's support to NFA's efforts to make good quality rice available to consumers, as well as to adapt better to the effects of climate change, citing damage to rice storage infrastructure when Typhoon Haiyan hit the Philippines in 2013. NFA and IRRI will collaborate in these specific areas: grain quality improvement, including assessment of consumer preferences and research to enhance quality; rice breeding, production, and processing (postharvest)technologies; and the establishment of quality standards in relation to the Sustainable Rice Platform (SRP), a key mechanism through which rice quality standards are promoted internationally. NFA and IRRI will also be sharing scientific data and research results as well as strategic analysis of developments and trends in international rice trade. The NFA is mandated to ensure the country’s food security and stability of the supply and price of rice, the country’s major staple. This collaboration is part of the NFA’s efforts to widen its partnership with both public and private sectors toward finding long-term and sustainable ways to achieve national food self-sufficiency and security. IRRI is the world’s premier research organization dedicated to reducing poverty and hunger, improving the livelihood of rice farmers and health of rice consumers, and ensuring environmental sustainability through rice science. Earlier, the NFA also signed a memorandum of agreement with the Kaya Natin! Movement, a civil society organization advocating good governance and ethical leadership, for a “Bantay Bigas” project to ensure that the NFA’s inexpensive quality rice will be continuously available, accessible, and affordable to poor consumers who are its intended beneficiaries. The 4th Rice Survivor challenge wrapped up for the dry rice-cropping season with Rice4Titans, the winning team, harvesting 7.01 tons per hectare (in terms of yield per hectare). The other teams harvested between 5-6 tons per hectare. The Rice Survivor is open to any staff member of the International Rice Research Institute (IRRI) who is up for the challenge of getting up from behind their desks and computers and going into the field, knee-deep in mud. A total of 28 participants—made up of national and international staff, consultants, and postdocs from the different units of IRRI—joined the 26-week challenge of lectures and field sessions, which started in November 2014 until 20 May 2015. The participants were divided into 5 teams: Risensors, RICEtastic 6, Keep Calm and Grow Rice, Rice4Titans, and Padiwackers. They gained firsthand experience in growing rice, from sowing to harvesting, including water, fertilizer, and weed management. They worked closely with IRRI scientists and researchers who served as resource persons and experts to guide the teams in meeting the same real-life challenges that farmers face in the field. Unlike previous seasons, where each team chose the rice variety they planted, all five teams planted one variety: the slightly aromatic, medium-duration Rc344. However, they were given free rein on the transplanting method to use, whether mechanical or manual. It is interesting to note that the winning team used mechanical transplanting with seedling trays while the others used manual transplanting. With the close of the 2014-15 dry season, what’s next for the Rice Survivor challenge? Here’s looking forward to Rice Survivor Season 5! LEGATO and BioLuz, two projects focusing on sustainable land use, held a symposium to present the progress of their respective activities in the Philippines. LEGATO (Land-use intensity and Ecological Engineering – Assessment Tools for risks and Opportunities in irrigated rice based production systems) is an international project on sustainable development of rice ecosystems in Southeast Asia funded by the German Ministry of Science and Technology. BioLuz (Biodiversity Indicators for Sustainable Land Use in Luzon, Philippines) promotes sustainable land use based on the application of biodiversity indicators and is funded by the German Academic Exchange Service. At the symposium, titled Natural and crop ecosystems from mountain peaks to lowland plains, LEGATO coordinator Josef Settle updated participants on the global achievements of the project and its connections to the Intergovernmental Science-policy Platform on Biodiversity and Ecosystem Services (IPBES). IPBES provides a common platform for science, government, and the private sector to exchange research on the economic value of ecosystem services. Dr. Finbarr Horgan, terrestrial ecologist at the International Rice Research Institute (IRRI), reported on IRRI’s research activities with LEGATO and their connections to the Global Rice Science Partnership. Dr. Damasa Macandog, professor at the Institute of Biological Sciences, University of the Philippines Los Baños (UPLB), reported on the progress made by BioLuz and introduced the Biodiversity System Monitoring Database for Luzon. The symposium featured 14 other presentations by students and staff from IRRI, UPLB, and the Museum of Natural History (MNH). 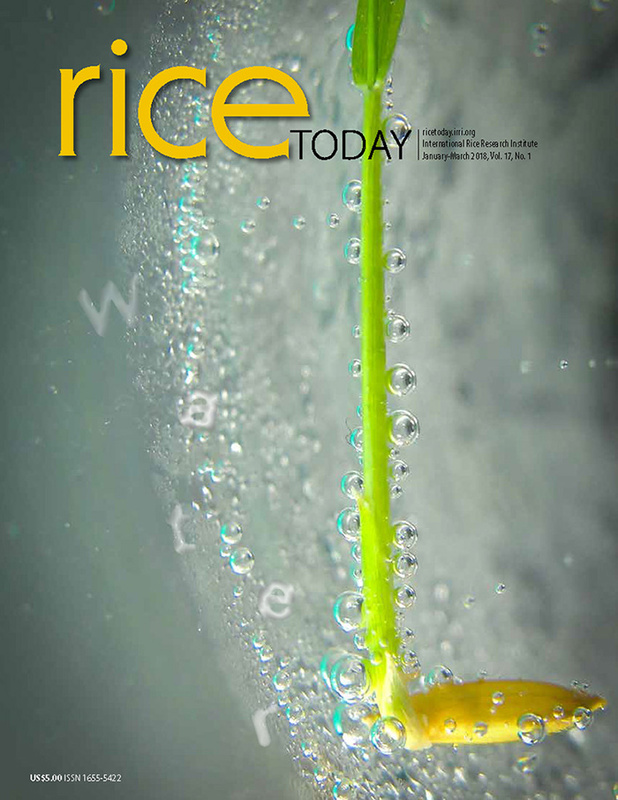 Among the presentations were the use of single-nucleotide polymorphisms (SNPs) to determine rice varietal diversity at the LEGATO sites by Suja Thanga Srinivasan, geographical patterns in the efficiency of brown planthopper egg parasitoids by Liberty Almazan, the autoecology of ladybeetles in rice fields by Aimee Agbay, and rules of assembly for rice birds in Asia by Angelee Fame Ramal. Josie Lynn Catindig, IRRI entomologist, and Aimeelyn Barrion-Dupo, MNH's curator for moths and spiders and associate professor at UPLB, discussed the history and state of the entomological collections at IRRI and UPLB, respectively. There was also an open discussion with Dr. Juan Carlos Gonzalez, director of MNH, on possible mechanisms to share resources between the two collections and to gain support on curation and modernization of these valuable resources. The LEGATO/BioLuz symposium was held at the Crop and Environmental Sciences Division, IRRI on 1 June. It was organized by ecologists/entomologists and environmental scientists at IRRI and UPLB. The event was an important step toward greater collaboration between scientists and institutes in Los Baños to improve knowledge on rice landscapes and ecology. ~ Learn more about IRRI (www.irri.org) or follow us on the social media and networks (all links down the right column). QUEZON CITY, Philippines – Filipino rice farmers are poised to gain even more from government efforts to help increase rice productivity as Philippine Agriculture Secretary Proceso Alcala acknowledged promising results from the field and pledged continued support to rice research. In a briefing on 1 June 2015 with project implementers of the rice research component of the Food Staples Sufficiency Program (FSSP), Secretary Alcala lauded progress covering various aspects of the country's rice industry and vowed to make sure technologies and interventions will benefit farmers. The rice research component of the FSSP is jointly implemented by the Department of Agriculture (DA) and the International Rice Research Institute (IRRI). IRRI Deputy Director General Bruce Tolentino assured the secretary of IRRI’s continued support to DA’s goals of helping the country’s rice farmers become globally competitive. Not only does Alcala want to see farmers make use of research-informed interventions, he intends to make use of documented results to help advise the government on sustainable expansion of agricultural areas, not only for rice but for other crops. He cited encouraging results from the accelerated development and deployment of improved varieties and from promoting the use of a suite of associated technologies to help increase yield in rainfed rice environments. The secretary instructed his technical advisory group (TAG) to apply lessons learned from the Philippine Rice Information System project to create information systems for other crops. He proposed intensified inter-agency collaboration to improve the capacity of agriculture extensionists, and encouraged visits to Heirloom Rice Project sites in the Cordillera region. The FSSP’s rice research efforts are funded by the DA Rice Program through the DA-Bureau of Agricultural Research. Implementing partners are the DA-Philippine Rice Research Institute (PhilRice), DA-Agriculture Training Institute, DA-Bureau of Plant Industry, and regional field offices. Alcala and the TAG were joined by Undersecretary for Field Operations Emerson Palad, Assistant Secretary for Field Operations and PhilRice Officer-In-Charge Edilberto de Luna, Director and Special Technical Adviser for the National Rice Program Edmund Sana, and DA-BAR Director Nicomedes Eleazar. Also present were implementers from IRRI and DA attached bureaus and agencies.